One of my dear clients, KW, recently moved from Grand Island to a city in Iowa, because of her husband’s job relocation. She loved Western New York and the family really loved Perry’s Ice Cream, especially the chocolate flavored Panda Paws, yummy! Recently, she contacted me through Facebook messenger and asked (as a by the way, thinking out loud sort of message) if there was any way that she could get Perry’s ice cream shipped to her house. Her husband had been having cravings about it for the past few weeks and she thought that getting him the ice cream as a surprise Valentine’s Day gift would be an awesome idea. 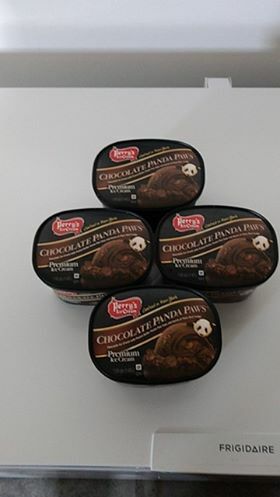 So, last week, I went shopping at our local Tops grocery store for some Perry’s chocolate flavored Panda Paws, purchased four gallon tubs, brought them back to the store and packed everything outside the dock door, since it was cold and snowing. The weather really helped. We checked the weather conditions in Memphis and Louisville to determine which carrier, FedEx or UPS, would be used. We opted for FedEx because the UPS Worldport Hub in Louisville was expecting stormy conditions the following day and I could not risk a delay in this shipment. After packing the ice cream inside the styrofoam container and adding some packing peanuts and cold ice paks, we labeled the shipment and left it outside for pickup later that day. We added many perishable stickers on the box as well. When my FedEx Express driver showed up, I explained to him what was inside and he was kind enough to leave the box in the back of his cold truck for another 4 hours while finishing up the rest of his pickups for the day, after which he headed straight to the airport to load all the boxes on the plane. I was so honored and grateful to be of service for this project. Making memories, one client at a time, is part of our mission at Island Ship Center.